The Wine Guardian is the industry leader in self-contained wine cellar cooling systems. The Wine Guaridan is the Best Climate Control Solution for Wine Storage on the market today. These systems are delivered pre-charged with refrigerant (R-134a), so installation is easy. Units are usually mounted in a room adjacent to the wine cellar; they can also be mounted inside the wine cellar. Wine Guardian is the only system which incorporates cooling, heating, filtration, humidification, ducting, internal safety devices and low ambient control as integrated solutions. It is the only unit capable of multiple installation configurations - thru-wall (flush, fully recessed or semi-recessed), remote mount, indoor or outdoor. It is the only unit capable of ducting on both the evaporator and condenser side. Made in the USA. 24/7 hotline for information and assistance. The Wine Guardian cooling unit is a professional, USA manufacturered, self-contained climate control unit designed specifically for the storage of wine at cellar temperatures. It is designed for easy installation and operation. Wine Guardian uses digital electronic controls and environmentally friendly R-134a refrigerant. The entire unit is run tested at the factory and shipped as a single package. All components are of a high quality standard commercial grade. The entire unit is approved by ETL according to UL 1995 and CSA safety standards. All wiring complies with NEC. Each unit is furnished with a sealed, UL approved power cord and plug. The Wine Guardian unit is completely self-contained and includes an integral air cooled condenser. The unit is functionally divided into two sections, the evaporator or cooling section and the condenser or heat rejection section. Each section contains a coil to add or remove heat and a fan to move the air through the coil and into or out of the cellar or adjacent space. The Wine Guardian unit is designed to be used either as a free blowing, through the wall unit or as a remote mount unit with external ductwork connections. Air from the cellar first enters a filter to remove any airborne dust particles and then enters the cooling coil. Air passes through the cooling coil and is cooled by the refrigerant inside the coil. This causes any excess humidity in the air to condense and be captured in the drain pan and piped outside the unit. Air then enters the fan where it is pressurized and discharged out of the unit. Operational heating coils are located between the cooling coil and the fan. These coils heat the air to prevent low temperatures in the cellar. The thermostat, located in the cellar, turns on the cooling or heating as needed to maintain its set point. It does not allow the cooling and heating to be on the same time. The compressor and condenser sections are activated whenever the unit is cooling. 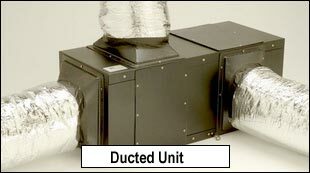 The condenser fan draws air from the surrounding or ambient space either directly or through a duct. The air is first drawn through a filter to remove any airborne dust particles to keep the coil clean. Then the air flows through the condenser coil where it absorbs heat from the refrigerant in the coil. The air is finally discharged out of the unit by the condenser fan. Evaporator Section - Cellar air circulated through the evaporator section by another blower the same as above. The large evaporator coil face area elminates condensate carry-over, reduces air pressure drop and optimizes heat transfer. A drain pan is located directly below the coil to capture condensate is fabricated from aluminum to prevent rust and corosion. The electric heating coil, if ordered, is factory installed between the evaporator coil and the blower, and is complete with contractor(s) and limit conrol. Electrical Controls - Most of the electrical components and controls are located in a separate area accessible through the condenser section. All wiring is in accordance with the National Electrical Code. Wires are numbered and color coded to match the wiring diagrams. Filters - Nominal 1" thick filters are provided on both the evaporator and condenser inlets to protect the coils from dust and dirt. These filters are washable and reusable. Supply / Return Grilles - Powder-coated steel single direction grilles are provided for the inlets to the evaporator and condenser sections. One grille is provided on an outlet. These are readily interchangeable with access doors to control and direct the airflow. These grilles many be used in the room on the end of the ducts in the ducted systems. What are the advantages of external ducting? Higher airflow capacities improves humidification and temperature control (more air changes per hour) and results in better temperature distribution throughout the cellar. Totally self-contained. No need to run refrigerant piping or install separate condensing unit. Requires only one electrical power connection. only units with commercial grade components like a refrigerant sight glass, filter-dryer and high and low pressure limit switches to protect the major components and improve serviceability. Each unit is furnished with a Thermal Expansion Valve (TXV) to automatically control the flow of refrigerant to the cooling coil in direct response to the load. Standard feature of on/auto for fan control allows choice of running the fan all the time to equalize temperatures or cycle on and off only as needed. use two units instead of one in critical applications or where loads are very high at certain times of the year but where only one unit is needed most of the time. Allows backup in case one unit is out of service. Low ambient control allows the unit to be installed in a garage or outside under cover where temperatures may be too cold for standard application. Condenser fan cycles to automatically control the head pressure and a heater maintains the oil temperature in the compressor. Add-on Humidifier with an electronic humidistat. Self-contained unit bolts directly into Guardian and connects to 24v control system. Requires only external water and drain. Heating coil works automatically with the cooling to prevent simultaneous operation. Factory installed, no field installation required. Duct collars and flexible ducts to connect Guardian to cellar. Sized to match capacity and outlets of each Guardian size. Collars connect to the Guardian unit and to the grilles - no need for additional wall grilles.